is sleek and slim. This is one good looking air cleaner, but does it work as well as it claims. This air purifier looks very similar to many products you see advertised on TV. This is NOT an ionic air cleaner. This uses real HEPA filters to clean the air. Do you spend your days sniffing, sneezing, coughing, and scratching because of hay fever? Have you accepted it as normal? It doesn't have to be so. The Alen T300 air purifier can remove the allergens from the air. It can reduce the irritation you feel almost immediately. Read on to learn more about this machine. The Alen T300 air purifier measures 11" X 9" X 28" high. Unlike the Alen T100, this is not suitable for a desktop or tabletop. This unit is meant to be placed on the floor. It only weighs 12 pounds. It is a little heavier than the T100. It is still very easy to move into other rooms. This air purifier is recommended for rooms up to 300 square feet. As always it will be better in a smaller room. This one will be great for any normal size room in your house. If your rooms are very large than this purifier won't work as well. Air-Purifiers-America.com tested this model and reported that it was the quietest air purifier they have ever tested. This would be ideal for use in a bedroom. The Alen T300 air purifier uses a HEPA filter. These filters can remove allergens like pollen, dander, dust, and mold spores from the air. HEPA filters are capable of removing 99.97% of the particles in the air. There is an activated charcoal filter attached to the HEPA filter. Activated charcoal will help remove odors and chemicals from the air. This model also has a UV light. The UV light bulb can kill germs and bacteria present in the air. This helps make the air safer to breathe. Alen also offers two additional filters: silver ion and MCP. The silver ion filter is treated with silver ions. Silver is used to kill germs and bacteria. The MCP filter is treated to remove smoke and odors from the air. The lifetime warranty requires that the filter be replaced every 6 months. Changing the filter is easy. Just pop off the back cover. Remove the old filter. Replace it with a new filter. It is quite easy and no tools are required. They offer an automatic filter replacement program for the Alen t300 air purifier. Sign up and they will deliver you a new filter every 6 months. This is very convenient and means you don't have to remember to order a new filter. The Alen Air T300 HEPA filter comes in a set of 2. The T300 uses both filters. The filters should be replaced every 6 months. The filters cost about $50 dollars. The silver ion HEPA filter for the T300 is about $60. A MCP smoke and odor filter is available. It cost about $90. It is supposed to remove odors and smoke. This air purifier also has a UV light. It is supposed to last at least 3 years, but it might need to be replaced yearly. It is about $80. You don't have to pay almost $80 for the replacement UV light bulb. It was reported that you you can use the Phillips PL5/UV light bulb. It has the same specifications as the Alen Air UV light bulb. It is a lot cheaper though. We did not thoroughly research this option. So, before you buy it please research it. Using this replacement bulb, while cheaper, would also void the warranty with Alen Air. So think, before you take this route. Like all Alen Air Purifiers, the Alen t300 air purifier has a lifetime warranty. The warranty requires you to replace the filter every 6 months. Alen will, at its option, either furnish a replacement part or replace your air purifier provided the product is determined to be defective as a result of faulty material or workmanship, while in normal use. Replacement parts or units will be either new or refurbished. Alen's sole obligation under this warranty is to replace, or at Alen's discretion, to repair, free of charge, all defective parts. It is only valid for the original purchaser. Shipping charges are not included in the warranty. It's very quiet on the lowest fan setting. It has a UV light to kill germs and bacteria. The ionizer produces no ozone. It has a sleek stylish design. We like the easy to understand and use electronic control panel on the Alen t300 air purifier. On the higher settings it is a bit noisy. All plastic construction means it is not as study as some other machines. Customer reviews of the Alen t300 are mostly positive. It cleans the room very well. It is very quiet on low speed. I have no more sneezing. There were a few negative comments. The UV light doesn't last very long. It is hard to replace the cover. Alen Air has bad customer service. To be fair another reviewer said customer service was excellent. We would be happy to recommend this product. This is a great air purifier for a small to medium size room. It will clean up to 300 square feet, but would do better at around 200 square feet. It would work well in a family room, bedroom, dorm rooms, studio apartments. Anyone with allergies or asthma would benefit from using this machine. If you have asthma, we recommend that you do not use the ionizer. Leave Alen t300 Page and Return to Alen Air Purifiers Page. Leave Alen t300 Air Purifier Page and Return to All About Air Purifiers Home Page. 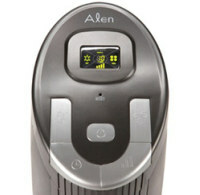 This is a small and portable air cleaner from Alen Air. It uses a HEPA and carbon filter. This is a medium size tower air cleaner from Alen Air. It uses a HEPA filter, carbon filter, UV light, and Ionizer. It also comes in an attractive lime green. This is the top of the line air purifier from Alen Air. It uses 6 kinds of filters: a pre-filter, a HEPA filter, a charcoal filter, an ionizer, UV light, and Photo Catalytic Oxidation.